Do you have timber verandah posts that need restoration? We can replace the rot in your posts with treated or durable timbers, glued laminated, without corrosive bolts and nails, to the sharp edges and clean flat faces you would expect from new posts. A post that, its structural integrity is restored by anchoring it below to keep the above structure tied down. · Extensive use of imported timbers such as Douglas Fir (Oregon) which has ceased being used due to the downgrading of its durability class. Where the window sashes connect at the joints. At the sill where your outside timber paneling is deteriorating at the bottom. Deterioration of MDF by moisture absorption on internal door frame and architraves. Local timber once meant permapine deck boards as straight as a dogs hind legs. They were often fixed down with nails into softwoods and joist being shared by 4 nails and 2 endgrain of boards. Suffice to say their days are numbered. Decks now are now built with a choice of no maintenance synthetic composite plastics, treated sustainable timbers, laminated or solid and a wide range of durable long life natural wood. The tops of the joist can be protected from moisture prior to laying the deck. The deck board face are either fixed with two screws or concealed by brackets where the deck boards are pressed into position for a full smooth board. Decks can be built close to the ground providing that air circulation and excessive water can be drained away by a good system. Decks structures can be well designed manufactured treated structural timbers. A variety of balustrade options that a practical home owner can construct. Looking for a Timber Post Repair Carpenter in Adelaide? 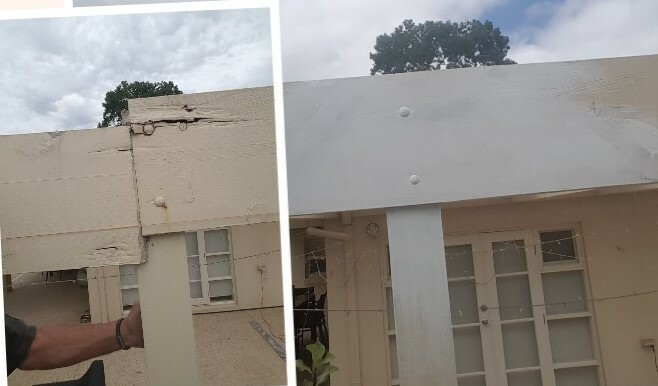 We can remove your tired gable weatherboard cladding and replace it with a profile that matches the original or it can be replaced with a readily available profile in either timber, cement fibre or a lightweight 'Skyon.' The choices can extend to flat sheet panels from James Hardies that either require flush jointing and a texture coat or requires only a sealant and painted over. Timber boards are available in a tongue & groove finish wood board ('Glosswood' under undercover) or LOSP timber in a Shiplap rebated profile. Splayed weatherboard or "V" jointed or Regency profile. Below the flaked painted surface lies the remnants of what was, the structure and hardness of wood. Now all the spongy decaying rot has to be excavated to expose the surface and remove until what remains is sound structural wood. This adjacent wood is then treated with a natural product that reverses the deterioration process by restoring the integrity of the wood and providing a barrier to protect from fungi, insects and contains fire retardant properties. Depending of the extent of the void the next step may require a cut to the surface so as a treated or durable wood can be milled and firmly adhered to the surface using a marine grade epoxy resin or equally a superior adhesive which is durable high strength and water resistant. The gouged surface would require a heavy duty compound putty to be built up as necessary. It may require a combination of epoxy resin, wood and compound putty. This process requires the products used reach their maximum strength before the final step. The final step is the finishing of the area this may require further filling and sanding so that the edges are sharp and the joints are flush so once covered with a primer or colour match the restoration is now complete. What Adelaide Hills locations, towns and suburbs does Nider Carpentry provide carpenters to help you with your internal restoration and repair, home frames, house frames, timber restoration and repair? Posted on October 18, 2018 by Llama Blue.